The Nanyang is in Malaysian territorial water, 10 nautical miles from the island of Tioman, which was a popular stop for fresh water on the Southeast Asian routes. The remains of the wreck sit upright on the seabed in 54 metres of water. Excavation is intended, some time in the future. So far the site has been only partially surveyed. The construction details noted so far, which include transverse bulkheads and wooden dowels, suggest a ship of the South China Sea type. The remains indicate that the vessel measured about 18x5 metres. The Nanyang carried an estimated 10-15,000 pieces of Si-Satchanalai celadon, and does not appear to have had any other ceramics on board. This may have been one of the earliest shipments including celadon plates. These are unusual for the spur marks on their face. Spur marks are also seen on the earlier underglaze decorated plates, but on celadon the disfiguring is more marked, and the practice of stacking with disc-shaped supports was thought to have been discontinued soon after celadon production started. By the time the Royal Nanhai sailed in the mid 15th century, spur marks on celadon are rare. Most of the large dishes among the 420 pieces recovered from the Nanyang display spur marks; only five of the thousands from the Royal Nanhai do. Instead, many pieces from the Royal Nanhai have circular scars on the base from tubular stacking supports; fewer Nanyang plates have these, and when they exist they are of larger diameter than the later examples - a size reflecting the earlier practice of stacking in piles. The foot-ring of the celadon plates on the Nanyang is tapered inwards and is shorter than on later ware; it resembles the foot-ring of the earlier underglaze black decorated plates found on the Turiang. Most of the Nanyang plates have an undecorated exterior and plain rim, and provide a stylistic bridge between the earlier Turiang and the later Longquan. The Nanyang also carried very large storage jars, maybe as large as the jars of approximately 260 litres on the Turiang and Longquan - much bigger than those on the later Royal Nanhai. 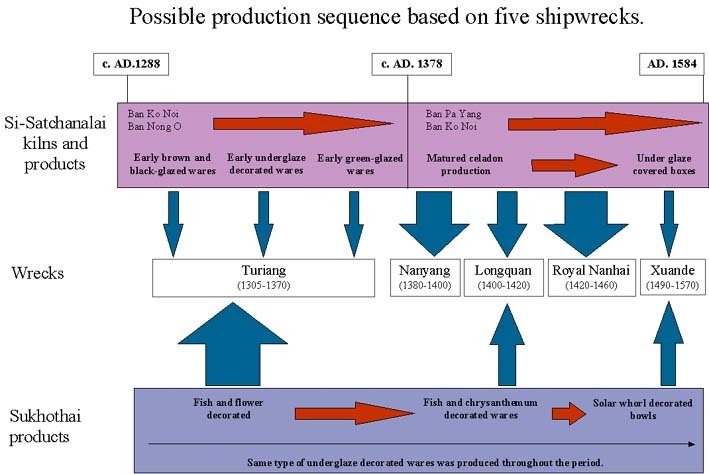 The Longquan may be one of the largest trading ships of the period yet found. Like the Nanyang, the site has been only pre-surveyed, but suggests a vessel over 30 metres long and 8 metres wide. The ship appears to have been built of tropical hardwood with a typical South China Sea design, and to be largely intact, so may eventually provide invaluable details on shipbuilding. Located 23 nautical miles from shore (15 from the nearest Malaysian island) and in 63 metres of water, this wreck would be time-consuming and costly to excavate. The Longquan appears to have been fully loaded, and the cargo of ceramics is estimated at 100,000 pieces. Samples collected from the surface include white-glazed porcellaneous bowls from southern China and celadon from the kilns of Longquan; Chinese ware represents perhaps 40% of the ceramics visible. Another 40% is Si-Satchanalai celadon of an early character, the majority distinguished by a rare bluish glaze unknown on the Si-Satchanalai celadon from other wrecks. The decoration of these pieces is more similar to those of the Nanyang than to the more elaborate decoration of the Royal Nanhai celadon. There are various dish shapes and jars; no jarlets have yet been seen. The remainder of the visible ceramics are Sukhothai ware, including underglaze black decorated plates, with fish and flower designs but not the cakra (solar whorl) motif which seems to have appeared around the mid 15th century. The later Xuande wreck has bowls decorated with cakra, but no fish or flowers. No Vietnamese pieces have been found so far on the Longquan. The Longquan is tentatively dated on the basis of the Chinese and Si-Satchanalai celadon to AD 1390. Sappanwood from the ship's cargo will be recovered as soon as possible for radiocarbon dating. No Chinese blue-and-white ceramics have yet been found on the Turiang, Nanyang and Longquan, which follow each other in time sequence. The earliest occurrence of Chinese blue-and-white will be interesting. These wares are believed to have been extremely scarce on Southeast Asian trade routes during the early Ming dynasty. The Royal Nanhai was a South China Sea vessel carrying more than 21,000 pieces of mature Si-Satchanalai celadon, which have provided new insights into mid 15th century techniques and developments. The cargo and position suggest that the ship was heading from Ayudhya to Java or Sumatra. The only wreck to have been fully excavated(1), the Royal Nanhai was found 40 nautical miles east of Kuantan in Peninsular Malaysia, in 46 metres of water. The Royal Nanhai is therefore about the same age as the Pandanan wreck, found in the Philippines in 1993. Both carried Chinese blue-and-white ware of the Interregnum period, but in both cases it was a small percentage of the cargo; 75% of the Pandanan cargo was from central Vietnam. There were four 14th century Chinese ceramics on the Pandanan wreck, two of them blue-and-white, which are assumed to have been part of an early antique trade. From the first exports in 1328 to the mid 15th century, Chinese blue-and-white ware seems to have been a rare commodity. Analysis of thousands of the Si-Satchanalai celadon dishes distinguished one group which had survived in relatively good condition, with a straight foot-ring, and little re-oxidised colouring in the base. These are likely to have come from a particular kiln which had perfected its technique. Besides Si-Satchanalai celadon and black-glazed storage jars, and various Chinese blackish brown glazed jars, a variety of utilitarian earthenware, probably used by the crew, was recovered. No Sukhothai ware was found on the Royal Nanhai, although there was some in the Pandanan cargo. Non-ceramic finds included bar-shaped iron ingots and conical lead ingots, and large concretions of iron, which appears to have been shipped in a loose granular form, spaced along the centre line of the ship. The iron shipment must have weighed at least 20 tonnes. Traces and imprints of woven bamboo on the iron ore indicate that it was packed in bags. The Turiang appears to have carried similar granular iron, but no ingots of any kind. Conical lead ingots were found on the Nanyang and Longquan sites. The hidden compartment contained exquisite items: a carved ivory sword handle (with traces of the vanished blade originally visible on the seabed), a cylindrical lacquer box and cover incised with floral designs, and an elephant-shaped bronze seal with a moon-hare impression. The ceramics recovered include Chinese blue-and-white porcelain and monochrome white-glazed ceramics, and Si-Satchanalai and Sukhothai underglaze black decorated ware. Seven of the Chinese pieces display the reign mark of the emperor Xuande (1426-1435), but two cannon imply that the wreck post-dated the arrival of the Portuguese in Asia(5), and date the wreck to the early sixteenth century. The ceramics may have been commemorative, as Xuande-reign pottery was highly regarded, rather than early counterfeits. The Sukhothai samples, with the 'solar whorl' motif believed to be from the later years of the Sukhothai kilns, confirm this later date. Sten Sjostrand, 1996, The Royal Nanhai Shipwreck and its Ceramic Cargo, including preliminary report on the excavations to date, written for the Malacca Museum Corporation, unpublished. Sten Sjostrand, 1998, The Ceramic Cargo of the Royal Nanhai. Unpublished. Royal Nanhai discovered 1995; excavation completed 1998. Royal Nanhai wood sample dating by Beta Analytical Inc. Radiocarbon report no. 125179. Conventional carbon age 560+/-50 years BP. Calibrated with the latest available data set and adjusted for additional year-rings of wood sample, seasoning/construction and the likely age of the ship when lost, the date of shipwreck was estimated as AD 1320-1460 at 95% probability. Similar in the use of figures in landscape in scenes separated by cloud outline borders. See Larry Gotuaco, Rita C Tan and Allison I Diem, 1997, op.cit. p 126. The Xuande cannon were of Portuguese design, but probably cast in Asia. Portuguese designs and influence may have preceded the arrival of the Portuguese themselves; they reached India in 1498, Malaysia by 1509, and China by 1513. Turiang overview Maritime Asia homepage End of main report. Other pages: bibliography, image archive, what's new, people/contacts.